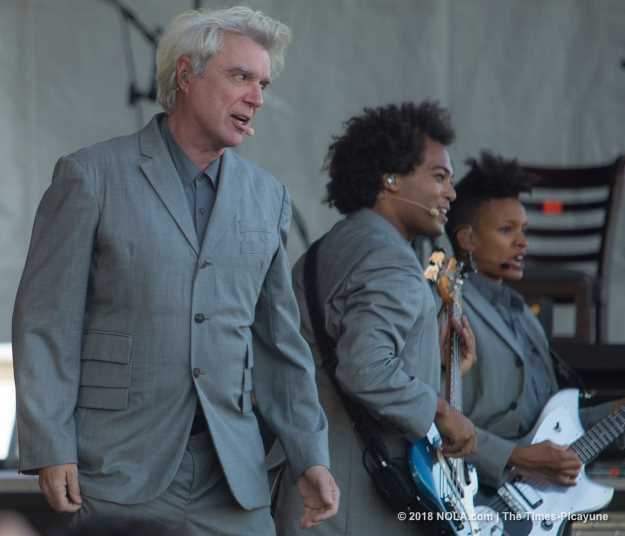 Ask anyone: Former Talking Heads frontman David Byrne's show on the first Sunday (April 29) of Jazz Fest was a trip. Byrne became the focus of popular attention in the early 1980s beside Peter Gabriel, Laurie Anderson, Sting and a few other artists/musicians who blended unemotional personas with poetic lyrics to help wrestle the world out of the clutches of disco. Byrne could seem utterly cool or, like his contemporary Elvis Costello, a nerd who somehow accidentally stumbled into rock stardom. People who listened to Byrne dabbled in sushi, drank Stolichnaya with cranberry juice and loved the movie "Dune." Lots of them went to art school. Older versions of those same people were thrilled Sunday when Byrne appeared onstage, took a seat at a small table and began calmly pointing out the regions of the human brain on a pink plastic facsimile as he sang a song titled, "Here." He was, as always, a weird, hip, cunning version of Mr. Rogers. Byrne fans were also thrilled when he was joined by 10 musicians, who were rigged with portable instruments and wireless mics, so they could travel freely and join him in stiff, robotic choreography. Naturally, everyone in the ensemble wore identical pale gray suits (imagine something in the austerity continuum between Pierre Cardin and Devo). All wore pale brown shoes, except for Byrne, who was inexplicably barefoot. (He should be careful appearing without shoes and socks. When Paul McCartney did that, a generation of Beatle freaks thought he'd mysteriously died). Byrne calculatedly added a few compelling new compositions and collaborations to his setlist amidst the crowd-pleasing Talking Heads tunes his fans pined to hear, such as "Slippery People," "This Must Be the Place" (my personal fave, not that you asked) and "Burning Down the House." All songs were executed with surgical precision, crystalline clarity and controlled verve (we're talking about David Byrne after all). He closed the show politically with a rendition of Janelle Monae's "Hell You Talmbout," which included the recital of the names of victims of police violence. Note: I once got to talk about conceptual art with David Byrne for about a half-hour while he drank a Sapporo (feel free to be envious).